If I had ever looked ahead and discovered I’d eventually be taking pictures of cardboard boxes, I never would’ve bought the camera. But here I am again. 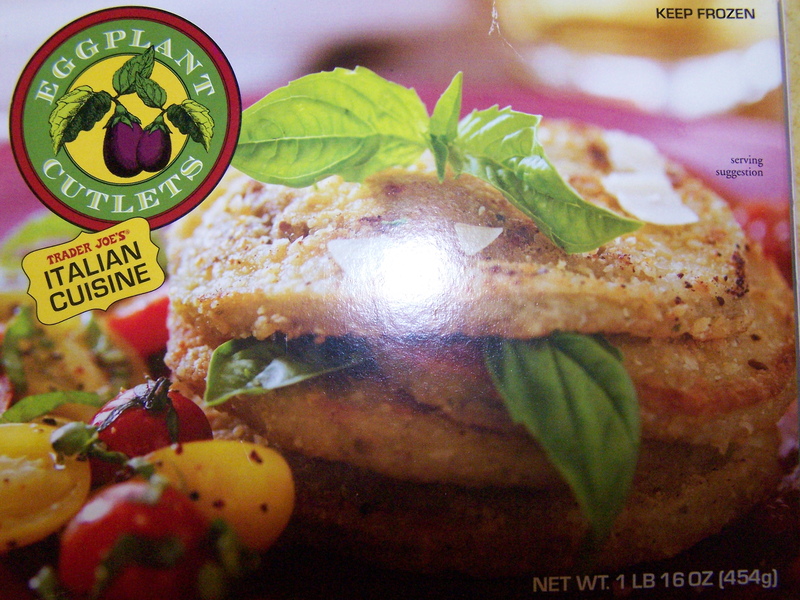 First it was the box of Trader Joe’s Spanakopita, and now it’s a box of Trader Joe’s Eggplant Cutlets. But to make something good out of something bad (taking the picture of the box is bad, not the cutlets themselves), there are two very interesting things about the box. Read on. This will eventually turn into a recipe. If that’s what you came for, keep reading. If you came here for something else, might as well waste another two minutes and keep reading anyhow. I got lazy on this one. Actually I got lazy a long time ago. It’s a time-honored tradition, so why not. But on this one, I decided not to make my traditional tomato sauce. I’ll call this a no-chop sauce. Instead of chopping up 4-5 (or 6) cloves of garlic and about a 1/4 of an onion, I used some bottled diced garlic (about 2 teaspoons, the wet kind in the jar) and about 1/2 a teaspoon of dried chopped onion as found in the little jars in the spice racks. If you want to pursue this path, follow the original tomato sauce recipe, just substitute the two ingredients above for the real thing. Ultimately, however, the real thing rules. The no-chop sauce was very acceptable when it was all put together, but not something you’ll find yourself licking the pot for. The other thing you’ll probably need for the no-chop sauce is a little water and additional sugar at the end. The cutlets themselves are actually quite credible. 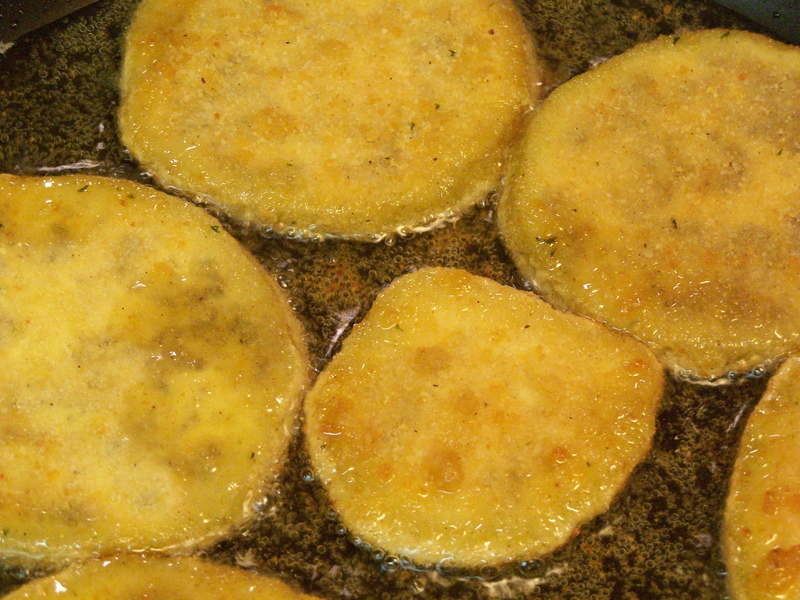 They appear to be real slices of eggplant, and not some pressed together stuff that the word cutlet often refers to. They are thinly sliced so they fry up nicely and are pre-breaded. As they’re cut from the eggplant the short way, they look like little hockey pucks (for all the Sarah Palin fans out there). 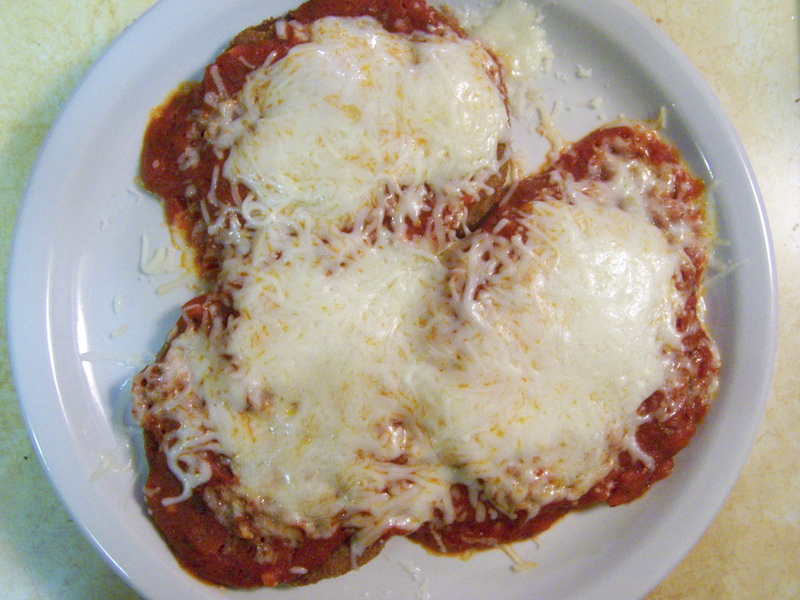 The basic recipe is: make the sauce, fry the eggplant as directed on the box, put the eggplant on a plate, cover with some sauce, cover with some shredded mozzarella cheese, put the plate in the microwave for 45 to 60 seconds to melt the cheese, eat. Now getting back to important stuff, the two noticeable things on the box itself. First, it’s difficult to find Trader Joe’s printed on the box. It’s sort of in really small print above the words “Italian Cuisine”. Don’t know why that is. Second the weight on the box is listed as 1 lb., 16 ounces. Now isn’t that 2 lbs. ? The bottom line on all this is: Trader Joe’s has a pretty good product here, again; this is another good recipe, and rather easy to fix up. And the final lesson learned, if you buy a camera find something better than cardboard boxes to use it on. This entry was posted on 06/26/2010 at 09:16 and is filed under Recipes, Trader Joe's. You can follow any responses to this entry through the RSS 2.0 feed. You can leave a response, or trackback from your own site.